We are all surrounded by spirits. Many people feel called to work with them, but few know where to begin. Enjoined by the gods and spirits to fulfill this need, Raven Kaldera and Galina Krasskova have reconstructed the indigenous spiritual traditions of northern Europe and Scandinavia extinguished more than one thousand years ago by the spread of Christianity. Arising from basic survival needs, these practical traditions are fundamentally tied to the elements found in the harsh world of the ancient North. Beginning with the skills tied to the Earth element, necessary for grounding prior to the more demanding aspects of the practice--working with Sun, Moon, Plants, Animals, Water, Fire, Craft, and Air--the authors explain, step by step, how to build relationships with each elemental spirit and the Ancestors. Offering 83 practical exercises, from cleansing with the Moon or borrowing the legs of Reindeer to making sacred space with Mugwort or creating an ancestor altar, they also explore building spirit relationships through altered states. Emphasizing the proper management of your spirit relationships to avoid spiritual debt or offense, the authors outline the ancient cultural rules and taboos that circumscribe these practices, essential knowledge for successful and fruitful spirit alliances. 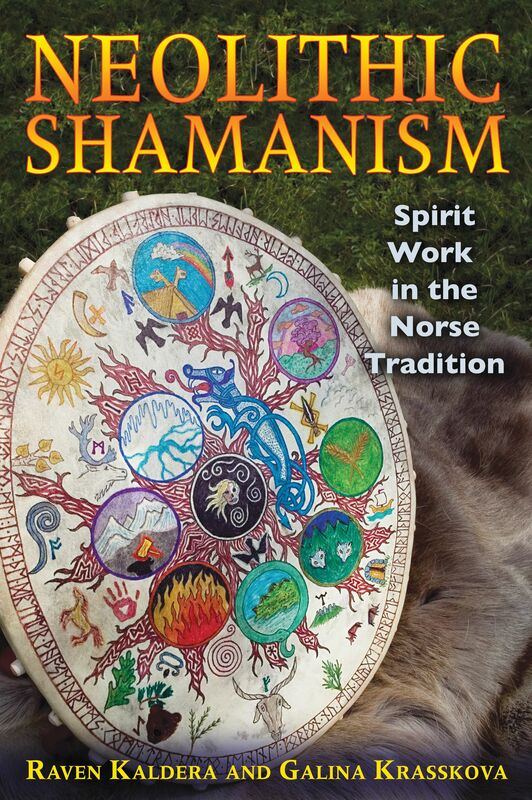 Detailing the beginning set of skills needed to work with the spirits of this ancient world, this comprehensive workbook offers a unique ancestral spiritual outlet for those of northern European descent as well as an accessible guide for anyone trying to fulfill their shamanic callings. Raven: Before each of my shamanic workings with a client, I light a flame and set the end of the silvery bundle of leaves and twigs on fire. I gathered these from my own land, bound them, and hung them to dry. I watched the Moon glint silver off their leaves, the Moon whose energy is so bound up with this plant named after the Greek lunar goddess Artemis. Her smoke drifts forth and she dances around me; I can see her drifting silver hair and silver-green skirts. I breathe her in and feel that moment of dizziness, of my inner eye opening. I wave her smoke around the room to purify it as I sing a small bit of a song of my ancestors that is a thousand years old, a song where she is the first power mentioned. Her smoke quiets the room and calms the client, and we can begin. Mugwort is the herb that is most often burned as recels (pronounced ray-kels), the Old English word for incense. The act of burning it is referred to as recaning, which can be pronounced various ways, but the most graceful seems to be reek-en-ing; the verb recan is cognate to our work “reek.” Celtic-tradition people use the term saining. It’s an alternative to the Native American-derived term “smudging,” and the herb can be bound in lashed bundles and burned in the same way as white sage. It also has a clearing effect on the mind and a heightening of the extra senses, so it is a good way to start any working that is going to involve an altered or trance state. Eventually, the mind becomes keyed to the scent of the herb, and the smell alone becomes enough to spur some people into a light trance, or at least into the necessary headspace for sacred work. Grandmother Mugwort is witchy, spooky, and incredibly powerful. Most report Mugwort as feminine, if ancient and mysterious. She is very lunar, but she is not the shining maiden new moon or the swollen full moon. She is the mysteries of the dark moon, the witchy crone with the wild mane of silver hair and the long, pointy fingers. Her voice is rough and cracking, and she cackles. She opens her arms and silvery magic pours forth in a cloud, and she can fill a space like no other plant we know, even beating out Juniper and American Sage. The only thing that comes close to Grandmother Mugwort’s power and presence requires a combination of several different herbs to achieve what she attends to by herself alone. She loves to work with psychic folk and lays very few rules; her attitude seems to be more one of “Knock yourself out! If you get screwed up, it’s your own fault and you’ll learn, now won’t you?” After which she cackles at you further. To her, your safety is not her problem, which can be good and bad. Mugwort has a variety of magical uses, including aiding in dreamwork, divination, protection, and the creation of magical tools. She also adds a layer of refinement to some workings, particularly those relating to cleansing and banishing because she has a scrubbing effect that clears out all kinds of energetic and astral clutter without the muscle that other herbs, like Rue, have. Simply put, she doesn’t need the muscle to get the job done with a great deal less fuss. Galina and I both have used fresh sprays of Mugwort as a miniature flail to cleanse the body’s energy field; the slap of the leaves and twigs had a very pronounced effect. Find some Mugwort growing in a field; it is often a weed by the roadside. Sit with the plant for a few minutes and try to call on Grandmother Mugwort; ask her to bless you and to aid the power of the herb that you are about to harvest. Ask permission to cut the plant--Raven has found that if he doesn’t have permission, his hand literally doesn’t want to go near it. Cut it just before it goes to seed. Let it sit for a few days inside until it is wilted but still soft, and then bind it together with natural-fiber string. As you bind it, try again to feel the presence of Grandmother Mugwort. Make a loop on the end of the “stick,” hang it up, and let it dry thoroughly. When it is dry, take your recaning stick and light the end with a candle flame, just enough to smoke. Wave the smoking stick around the area and ask Grandmother Mugwort to cleanse the energy of the area. Breathe in the smoke--carefully, so as not to choke--and ask her if she will be your ally and what she wants for that service. What you want is for her to be there whenever you purify a space, adding power to the inherent energy of the plant itself. It’s best to make first contact with Grandmother Mugwort through her smoke, but once you’ve done that, you can also make a tea with a few bits of Mugwort leaves brewed with it. Drinking herb tea literally brings the stuff of that plant into your body and allows the spirit to speak to you directly. Relax and imagine her silvery energy moving through you. Ask her for her wisdom and to aid you in opening your inner eyes at times when you are stressed and unclear. If she speaks to you and agrees to help, you can ask her for advice on what you can do to help your own signal clarity. She will likely have something to say on the matter; but if you ask, be prepared to grit your teeth and take her advice.